Home / Six Sigma / What is Stakeholder Analysis and Why it Helps Six Sigma Projects? There are many project management tools in Lean Six Sigma. Green Belt training provides a wealth of tools to navigate your Six Sigma project through the DMAIC approach. 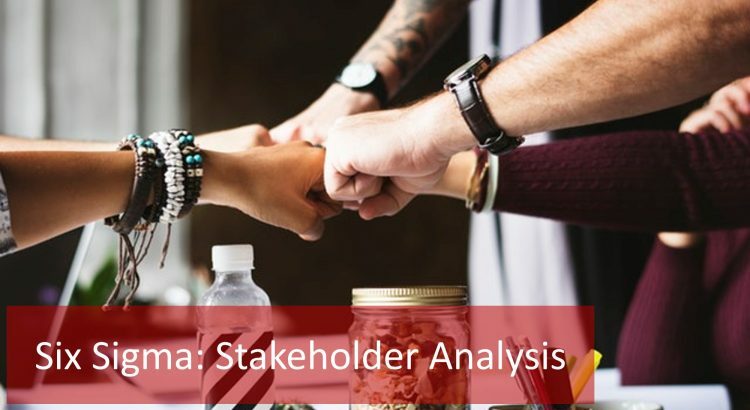 One of the crucial project management tools that are used early on in the Six Sigma approach is the Stakeholder Analysis. The stakeholder analysis helps to understand who will help and who will hamper your project. The stakeholder analysis also helps to identify communication and management strategies needed for your project to succeed. A proper stakeholder analysis is one step towards guaranteeing project success – you will have the resources and support you need and the ability to anticipate when change management will be necessary. We are now going to talk about the process of identifying stakeholders and doing a stakeholder analysis. You can also have a brief introduction to Six Sigma terms and principles with the help of an online free Six Sigma training. Stakeholder Analysis: What is a stakeholder? The stakeholders to be considered in a stakeholder analysis for Six Sigma projects can be internal and/or external. Let us first understand what the word ‘Stakeholder’ means in a Six Sigma project. Stakeholders are the people or group of people who can influence or are affected by your project, both inside and outside your organization or business unit. Understanding who these people or groups are and what they want or expect from the Six Sigma improvement project via a thorough stakeholder analysis can really help you prepare to deal with their needs and concerns. What is Stakeholder Analysis Definition? Project stakeholder analysis is a project management tool. It helps identify internal and external stakeholders that are likely to affect or be affected by a proposed solution as a result of the implementation of a Six Sigma project. The possibility is that these stakeholders could be directly involved in the project too. Stakeholder Analysis: Identify your stakeholders! 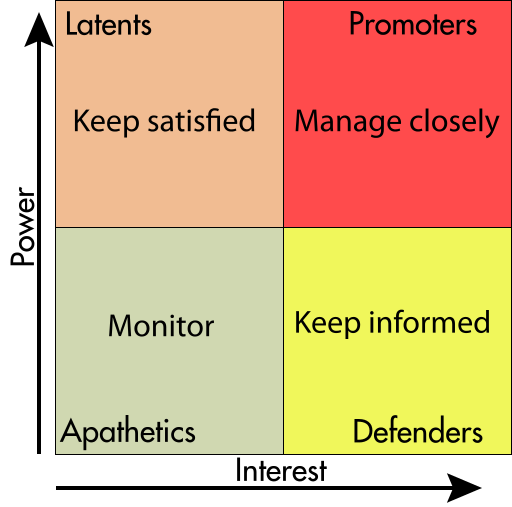 Stakeholder Analysis: Who can be your stakeholders? Project Sponsors, Champions, Customers, Suppliers, Creditors, Debtors, Departments of the performing organization participating in the project, etc. are some examples of internal and external stakeholders; who can be identified by using the project charter. Stakeholder analysis is a key project management skill. It is the process of identifying the individuals or groups that are likely to affect or be affected by a proposed action and sorting them according to their impact on the action and the impact the action will have on them. Stakeholder analysis enhances the ownership of the project’s success (including sustaining the improvement) among the stakeholders. It improves communication among stakeholders too. You can identify the most powerful stakeholders and have them help shape your project in its early stages. This will ensure their buy-in, secure their support, not to mention the valuable input they could give. When you gain support from your most powerful stakeholders, you will win more resources – making your project more successful. Communicating frequently with your stakeholders will help them to fully understand what’s going on with the project and how they can support you. A good stakeholder analysis will show you how people will react to changes due to your project and will guide you to win over difficult stakeholders. A Project Stakeholder Analysis Worksheet should be used early on in a project, to help the team develop a communication strategy and ideas for keeping those outside the team informed of the team’s progress. Do they have a positive or negative interest in the outcome of your work? Financially? Emotionally? What information do they require from you? How should you communicate with them? Email, phone, face-to-face? What do they currently think about your work? What information are their opinions based on? Who influences their opinions, more specifically, who influences their opinion of you? Should this influencer can also be a stakeholder? How can you win their support? How can you manage their opposition to your project? Who else could they influence with their opinions? While it may seem daunting to ask these questions directly, you’ll be surprised at how open people can be about their views. Asking a person’s opinion helps to open the door to a successful relationship. The most important outcome of a stakeholder analysis is to know which stakeholders will support you and which stakeholders are likely to block you. If you know this, you can manage your stakeholders accordingly. Based on your stakeholder analysis you will be able to anticipate which stakeholders will require some change management as you progress through your project. Not everyone is open to improvement projects, and not everyone believes that the improvement will really better your results. Embarking on a Six Sigma project is not to be laughed at, Pand many stakeholders might disagree with the resources allocated to the project. If you have done a proper stakeholder analysis, you will know who the important nay-sayers are and how to appeal to them. Why Do You Need to Listen to the Voice of Customer?